this MSSC Maharashtra Suraksha rakshak recruitment 2018 notification. 500 the posts are reserved for women candidates and 1000 posts are reserved for male candidates. Interested male/female candidates can apply for this MSSC Maharashtra Security Guard jobs online from 19-09-2018 to 30-09-2018. For Maha Security Security Guard vacancy candidates must have passed 12th class or HSC. Candidates selection for this Male/Female Security Guard Jobs will be held based on physical efficiency tests PET and physical standards test PST and merit in 12th class. These MSSC Maharashtra Male/Female Security Guard jobs are purely contract basis. 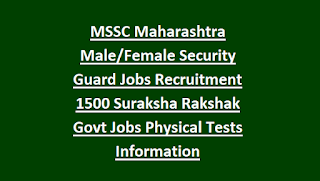 More information about this MSSC Maharashtra Women Security Guard vacancy recruitment notification, number of vacancies, physical tests, physical events date, age and other details are given below. Physical test dates and admit card released date will be announced later. 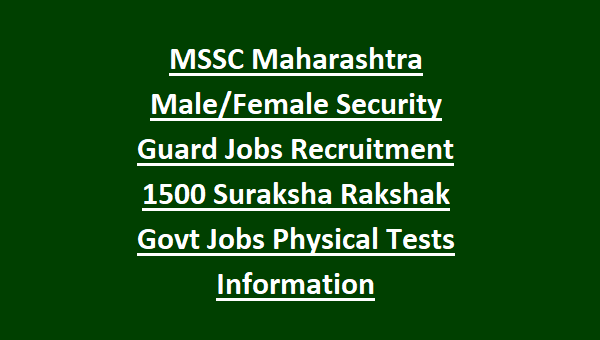 Total 1500 Me/Women Security Guard vacancies are in this MSSC Maharashtra State Security Corporation recruitment notification. Candidates age limits are as on 30-09-2018 is 18-28 years for applying this Maharashtra Mahila Suraksha Rakshak Security Guard vacancy. Candidates have to Rs.200/- towards application fee online only at the time of application form submission. Candidates selection will be held through merit in Physical tests, PST/PET and based marks in 12th class exam. There is no written exam for this Women security guard jobs. Total recruitment process will be held for 100 marks. Candidates must have minimum height of 160 cms and weight 45 kgs for applying this mahila Suraksha rakshak vacancy of MSSC Maharashtra. Only 800 meter running will be conducted in Physical tests for female candidates and for Male candidates 1600 meters running will be conducted. Candidate have to clear the 800 meters running with good merit. For Running 50 marks will be given. 50 Marks will be given if candidates score above 70% in 12th Exam.